As a Hamilton Beach Brand Ambassador, I recently had the opportunity to try out their versatile Set & Forget® 6-Quart Programmable Slow Cooker. It offers three options for easy, automatic cooking: Program, Probe, and Manual mode. On even the busiest days, simply program the cooking time and it automatically shifts to Warm mode when the cooking time is up – how convenient! Cooking a large cut of meat? Simply insert the included probe, set the desired internal meat temperature, and the Set & Forget® Slow Cooker automatically shifts to Warm mode when the desired temperature is reached. For traditional slow cooking, manually select High, Low, or Warm without setting a cooking time. The Set & Forget® Slow Cooker is travel-friendly too! The convenient clip-locked lid provides a tight seal to help ensure your dish arrives without a messy spill. That makes it perfect for any upcoming holiday parties and football-watching get-togethers you have planned. I decided to use my Set & Forget® slow cooker to try something new for me: baking! I had never used a slow cooker to make dessert, so I was curious to see how it would turn out. I was visiting my parents last weekend for Mom’s birthday, so I asked her what dessert she’d like to me to make. Her immediate answer was, “Chocolate!” I found an easy-to-make recipe for a turtle slow cooker dessert at the Betty Crocker website. I made some changes to their recipe to suit our tastes. I added vanilla, a bit of cinnamon, and a cup of high-quality chocolate chunks – because you can NEVER have too much chocolate. I also used half white sugar and half granulated brown sugar to enhance the dessert’s caramel undertones, subbed dark cocoa for the regular called for in the recipe, and used salted caramel sauce instead of regular caramel topping. The consistency of this brownie-like dessert is rich and fudgy -- perfect for pairing with a scoop of vanilla ice cream! Step 1: In a mixing bowl, combine the baking mix, cocoa powder, cinnamon, 1/4 cup granulated sugar, and brown sugar. Stir to combine. Add the milk, vanilla, and 1/2 cup of the salted caramel topping. Stir well to combine – the mixture will be look like a stiff brownie batter. Step 2: Add the chocolate chunks to the batter until evenly incorporated. Spray the slow cooker insert liberally with nonstick spray. Add the batter to the bottom of the slow cooker insert and use your hands to pat it into an even layer. Top with the hot water – DO NOT STIR! Finally, sprinkle the additional 1/2 cup of granulated sugar on top. Turn the slow cooker on LOW heat. Cover and cook for 2.5 hours. Step 3: After 2.5 hours, turn off the slow cooker and remove the lid. Drizzle the remaining 1/2 cup of salted caramel sauce on top of the warm pudding. Sprinkle the chopped pecans evenly on top of the caramel. Let the pudding cool for 20 minutes, uncovered. When ready to serve, use a sturdy serving spoon to place a scoop of the brownie-like pudding onto a serving bowl. Serve with a scoop of vanilla ice cream, and drizzle a bit more caramel sauce and chopped pecans on top. This rich dessert is perfect for the slow cooker – the low, slow cooking basically allows the pudding to steam. The edges are cake-like, and the center is moist and fudgy. It’s quite rich -- especially with the ice cream, so keep the servings on the small side. The warm brownie-like pudding and gooey salted caramel are a perfect match for vanilla ice cream! I have to say that baking with the Hamilton Beach Set & Forget® Slow Cooker was very easy. I locked on the lid, selected the LOW heat mode, and set the timer for 2.5 hours. That gave me a pocket of time to visit with my parents while it cooked away in the kitchen. 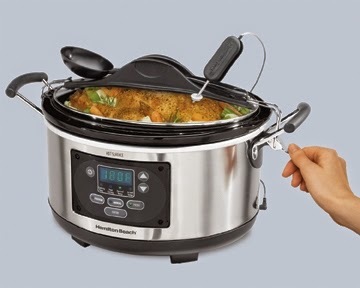 My friends at Hamilton Beach are also going to give one of my readers one of these amazing Set & Forget® Slow Cookers to use in their kitchen to create #SlowCookerMeals of their own. To enter, simply following the directions in the Rafflecopter below. I’ll accept entries until 1159 p.m. on Sunday, October 19th, and the winner will be notified via e-mail on Monday morning. Good luck! Disclosure: Hamilton Beach provided me with a Set & Forget® Slow Cooker to Brand Ambassadors – including myself – as part of an October slow cooker promotion. All opinions expressed are solely mine.